On my 2006 T-1950 nearly every lens on the marker/clearance lights is cracked (red and amber). The ones I've looked at are Bargman 68. It looks like this style is out of production. Someone has had to have dealt with this, but I have not found any threads. I can rewire new, but I'd rather not. I'd really like to use the same holes. Suggestions. Personally I would go to the effort to replace all of them with LED's They are hateful things no sooner you get them all working one on the other side will go out. Most likely the sealant on the old ones by now is pretty hard any way. When I was a teenager I worked for a local gas station (they used to fix things back then) and we serviced school buses I learned to hate clearance lights one of the very first things I did to my Sunline when I bought it was to replace the clearance lights with LED's all of them still burn 4 years later and I haven't touched them! I second the LED installations. Chances are you will not have light problems with them. "If" you have lights that do not match old holes they will most likely be under the new fixture so covered and sealed. 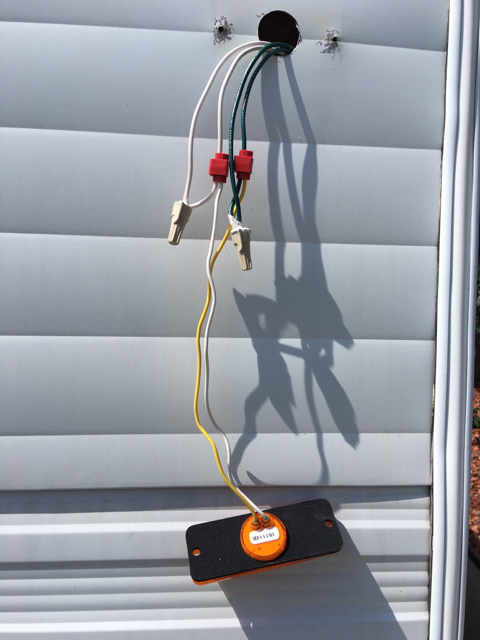 I use LEDs on camper and utility trailers and never have problems. I feel like I'm wasting time when checking lights before a trip since they are always working properly. You and Mainah, I hate you both right now. . LEDs are typically the way I would go, but I'm not feeling very ambitious given that I just got done building a pole barn (actually a pole roof) for the Sunline (and actually it isn't finished, I have to still put ridge cover, rake molding, and gutters on it). So, I'll take your suggestions and think about them. I have all LEDs in the camper and on all my boat trailers and love them. 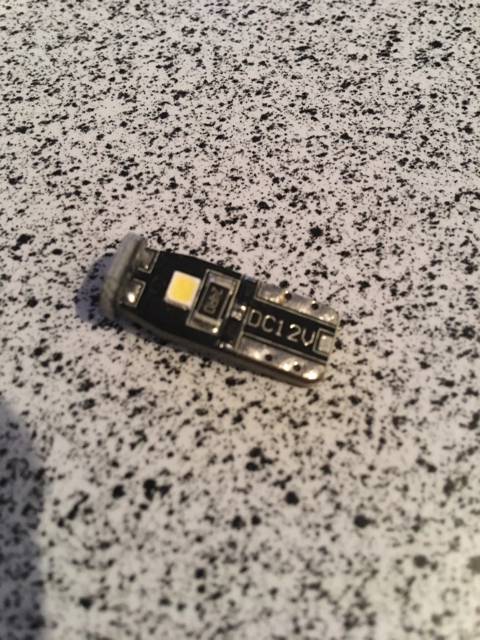 If I could find an LED marker with the same screw pattern that would make me much happier. 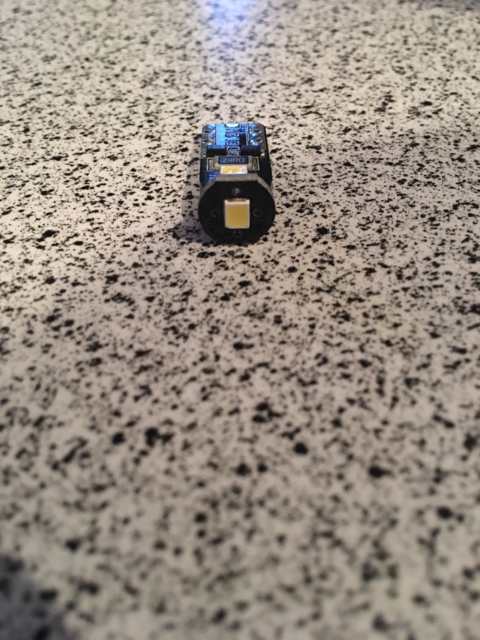 I found a direct replacement lens cover that is supposed to fit the original Bargman base for 2.50 per and I'll use those with led replacement wedge base bulbs (so not wiring and no new screw holes). I post up the item number for others once I confirm it fits. Using the led bulbs only cures the fast burn out of the regular bulbs it does nothing for the very poor connections to the bulbs. 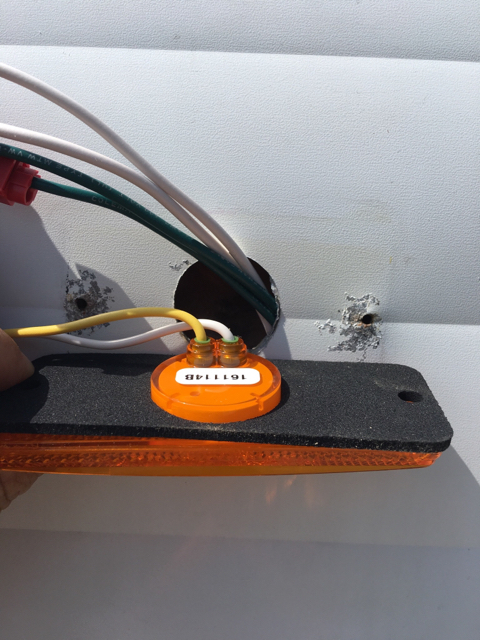 The led fixtures are sealed and hard wired and will out last the camper they also burn when you turn the lights on every time. The ones I bought were made for a Kenworth there was nothing that lined up I made the mods and resealed the new one far better than they were from the factory. I would beat old screw hole surfaces flat. Then cover them with small patches of aluminum tape that will be hidden by the new fixtures. Old screw holes do not hold as well as fresh holes especially if water has caused screws to rust...... JMHO. A good pole barn will go a long way towards keeping the camper safe and sound. Most of the fixtures usually have a drain and can be mounted upside down thus filling with water. Granted the power usage is all most nill because the truck is lighting them the big issue is having them light when they are needed the most. Old clearance lights are not too reliable and I hate fixing some thing when I'm ready to leave. Camper lighting fixtures in general are pretty poorly made and have not improved much over the years. On my 2004 campers, they had the same Bargmen as your 2006. On those, there was no drain holes so I added 2 little 1/16" holes in the bottom to let the water out. Amazing it was filled and not leaking in. Pure luck is all I can say. After seeing the water inside, they all have drain holes now. I have a few spare lens, both red and amber but they will not last forever as they seem to crack easy. I agree with mainah, it is not fun fiddling with running lights when it is time to get going. 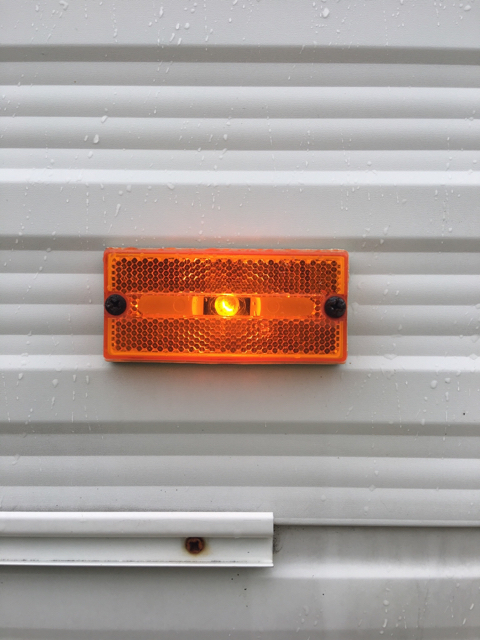 I have a utility and flat deck trailer that the tail light fixture are junk. The use a split connection in brass plate and you stuff the wire in to make a connection. It works good on day one when new, but after it has been out in the weather corrosion sets in quick and the connect does not make. I have to find some kind of quality replacements for them. The camper, while not the greatest they are a step above the utility trailer ones. I'll have to look up the LED sealed units for the utility and flat deck. Let's open this up again. I was looking at mine this afternoon after returning from a weekend trip....the water intrusion stories have me worried to my core. I noticed that they didn't look very good, so I removed one just to have a look. The white frame was broken on the one that I removed and a previous owner had applied silicone over the cracks. and while not really "wet" under the marker, it was a little damp. I'm now in an all out search for replacement LED marker lights. I didn't realize there are hundreds of them on the market and almost none of them are flush mount with a gasket. I did find this one 47733 - Sealed Rectangular LED Clearance Marker Light but it's $18+. 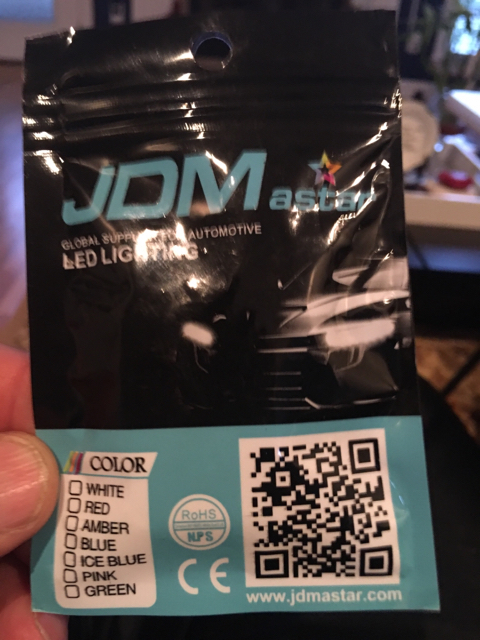 Has anyone found a good LED replacement with a gasket? These are not LED's, but are a direct replacement for Bargemen 68's. The fit the screw holes in the camper and come with a new foam gasket. I just bought 2 campers worth of red and amber. They do not come with the screws though. I converted to stainless screws. Odd the amber are cheaper then the red but both are under $2.20 each. I have drilled 2 small holes in them to let the water out when the time comes to get in. I did this on the old ones and it stopped the water build up but the sun just cooks these things and winter cold cracks them even if dry. 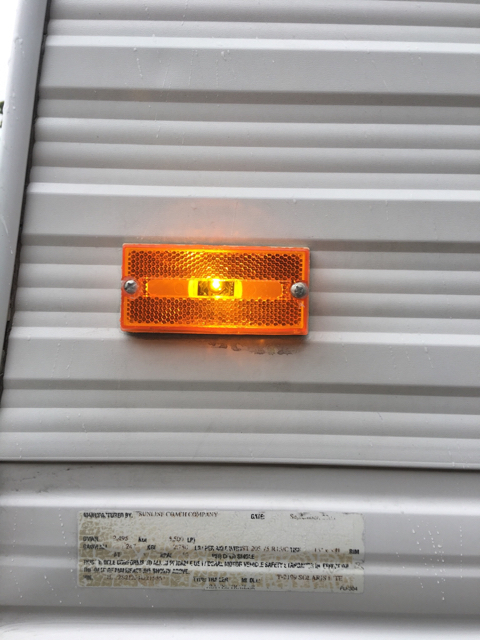 I installed one of the Grote 47733 marker lights today and while I do like the light, I do not think they will be worth the time and money in the long term. 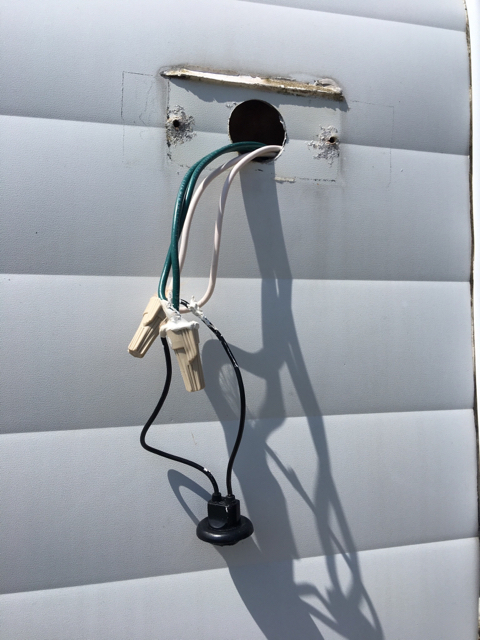 Main problem is that the round portion on the back of the light is 1 3/8" and the original hole in the trailer wall is only 1 1/4". I had to use a half round file to enlarge the hole before mounting. I wanted to use a step bit to enlarge the hole but the one I have was a little too long and I was afraid I would puncture the paneling on the inside. I then used 2 #10 stainless panhead sheet metal screws dipped in ProFlex RV sealant to prevent water getting inside through the screw holes. 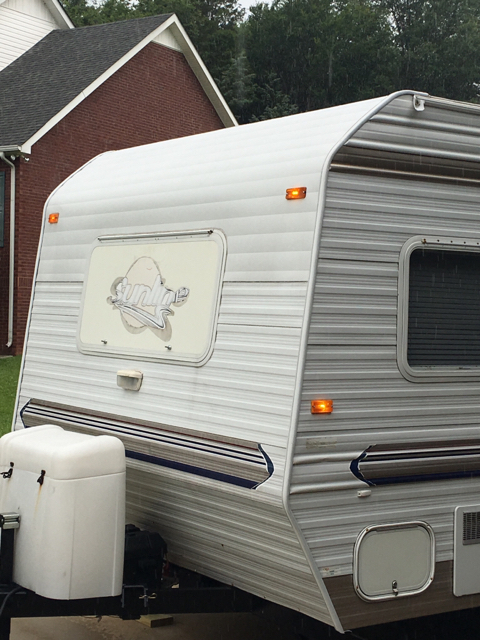 Once the light was securely mounted, I sealed the top and sides with ProFlex RV. I also received the LED replacement bulbs for the original marker lights. These LEDs appear to be a great replacement for people wanting to transfer to LEDs in their #68 lenses. Here is a shot of the incandescent bulb. And here is a shot of the replacement LED bulb. For me, I will go ahead and replace all of my incandescent bulbs and then over time, swap them all out for the Groat lights. I like the fact that I would never again have to worry about them not working or leaking. GREAT post and pics! Thanks, this is great stuff. I like the idea of the LED replacement bulbs.